Phillies State of Mind - Remake of Jay Z and Alicia Keys "Empire state of mind"
What yall know bout Benjamin Franklins? Now let's hear it for the Phillies, Phillies, Phillies! Anthony "Rumble" Johnson to fight Koscheck at UFC 106? UFC welterweight contender Josh Koscheck announced via Twitter earlier tonight that he will be fighting in the co-main event at UFC 106 next month. He did not name an opponent but I believe it is none other than Anthony "Rumble" Johnson. Johnson just knocked out Yoshiyuki Yoshida last Saturday night at UFC 104. Johnson did not suffer any injuries at all in his quick first-round victory. What Koscheck and Johnson have in common is that they both brutally knocked out Yoshida, and they both train in the Bay Area. Some fans are speculating that Koscheck's opponent might be Matt Hughes or Paul Daley. I don't believe it is either of them. Hughes has already stated that he is not interested in fighting Koscheck, and he would not take the fight with only a few weeks notice. Daley would be a good opponent for Koscheck, but just like Hughes', he probably would not be ready on November 21 to fight. I expect the UFC to announce Johnson as Koscheck's opponent sometime later this week once all the contracts are signed. The UFC needs some good fights for UFC 106 since the scheduled main event between Brock Lesnar and Shane Carwin has been postponed until next year due to an illness to Lesnar. Johnson did not endear himself to UFC President Dana White after coming in six pounds overweight in his fight against Yoshida. What better way to get back in White's good graces by fighting again next month against another top contender like Koscheck? The match makes perfect sense for the UFC, Koscheck, and Johnson. Fans want to see Johnson against a top-level opponent, and Koscheck needs a win against a tough opponent like Johnson so he can earn another title shot against UFC welterweight champion Georges St.Pierre. 1. Will Anthony "Rumble" Johnson make weight this afternoon? Johnson is probably the biggest welterweight fighter in the UFC next to Thiago Alves. Can he cut down to 171 pounds today when he and his opponent Yoshiyuki Yoshida tip the scale? 2. Can Shogun Rua do what 15 other opponents were not able to do and that is to beat UFC light heavyweight champion Lyoto Machida? Rua is a huge underdog going into tomorrow's main event fight. 3. Will Can Velasquez get a title shot if he beats Ben Rothwell tomorrow night? Rothwell is bigger than Velasquez and has more experience in the cage as well. This is Rothwell's UFC debut and is there a chance he will suffer the "UFC jitters" that has striken many other fighters making their first appearance in the Octagon? If Velasquez wins impressively, he should be the number one contender in the heavyweight division. A fight between him and Junior Dos Santos would be interesting though and that fight could determine the next number one contender. 4. Which fight will be Fight of the Night tomorrow? This is a very tough question as we don't know what to expect in the main event. Will it be a boring and slow fight? Could we l we see another one-sided dominating performance by Machida? The lightweight fights are usually fast-paced and there are two tomorrow evening. Joe Stevenson will take on Spencer Fisher and Josh Neer will face Gleison Tibau. Either fight could be a nominee for Fight of the Night. 5. There are four fighters who are undefated so far in their mixed martial arts career. They are Machida, Velasquez, Chase Gormley, and Ryan Bader. Will they all stay undefeated after tomorrow night? Bader will be taking on Eric Schafer and Gormley will knock heads with the very tall (6'11') Stefan Struve. 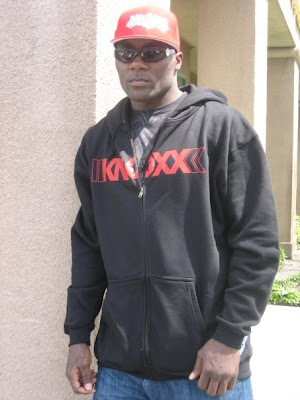 Here is a great interview with UFC fighter Anthony "Rumble" Johnson. The interviewer in the two videos below is Meredith DiVita. Here is a video of a game in the PBA(Philippine Basketball Association) where a player for the Burger King Whoopers named Wayne Arboleda beats up a fan in the stands. I recently spoke with former Kentucky Wildcat quarterback Shane Boyd. Boyd is the starting quarterback for the California Redwoods of the UFL. The Redwoods are 0-1 after losing last week to the Las Vegas Locomotives 30-17. The Redwoods have their home opener this Saturday night in San Francisco at AT&T Park against the New York Sentinels. Fans can purchase tickets for the game here. Boyd was a star at Kentucky, throwing for 2,484 yards and 13 touchdowns in his college career. He has also been with the Pittsburgh Steelers, Arizona Cardinals and Houston Texans in the NFL. How does it feel to be the first ever player to score a TD in UFL history? It is a blessing. I thank God for being in that position. J.P. Losman [Locomotives' starting QB] and his offense had the ball first and they had the first opportunity. I was blessed to get into the end zone. It is a good accomplishment and it is something that can never be taken away. I am very happy to be a part of the UFL. How do you like playing for your head coach, Denny Green? I love playing for Denny Green. He was the coach when I was with the Cardinals so I am accustomed to him and his very high expectations. He wants the best out of his players and he recognizes a lot of talent that the NFL doesn't see. He is a great coach. You guys had a good first half scoring 14 points but only had a field goal after halftime last week. What were some of the reasons the offense struggled in the second half last week? There were good plays called but we just had bad execution. It was nothing that Vegas was doing to us, and we were just stopping ourselves. We had dropped balls and it was just a bad connection between the wide receivers and the quarterback. The three-and-outs just gave Vegas a lot of momentum. You guys released wide receivers Bobby Sippio and Mark Bradford earlier this week and added Doug Gabriel and Glenn Holt. How will Gabriel and Holt help the team? Glenn was my No. 1 wide receiver in college and we are best friends and have known each other for years. Glenn has great speed and he was in the NFL with the Bengals as a kick returner. He can stretch the field and put a lot of pressure on the defense. I have worked out with Doug before. He is a bigger body and can get position on cornerbacks. He has great speed too. Glenn and Doug are both veteran guys with a lot of experience and swagger. How hard was it to get into a comfort level with the wide receivers after only a few weeks of practice? It's hard. You only have four to five weeks to develop chemistry in practice while in the NFL, the quarterback and the wide receivers on each team have played with each other for years. It's something you just got to go through with a lot of reps and individual drills. It's good that I already have a relationship with Glenn. How important is it to win this game and not go 0-2? Is there a sense of urgency to win since the next two games will be on the road and you have to travel to the East Coast? Is this a must-win game? I wouldn't say it is a must-win game but we need a win with the season being so short. We need to win and stay in the mix of things so we can go to the championship game in Vegas. It is an important game and we want to go in with a clear mindset and execute our offense, make great plays on defense, and get turnovers. Are you excited about the home opener this Saturday night and having the fans cheer for you? Yes, it will be great for the fans to finally get to see us play. We want to put on a great show for the fans. I know San Francisco and the Bay Area support their football teams. I am hoping for a great turnout and I want to put on a great show for all the fans out there. The Sentinels gave up 35 points last week. Do you think you can exploit their defense the way Losman did last week? That is the plan. They have a great defense and their game could have gone either way. They had a fumble on the goal line, and the game could have flip-flopped. Their defense has a lot of swagger and they got Simeon Rice coming off the edge. What did the offense work on this week to prepare for the Sentinels' defense? We worked on being more consistent. We focused on cleaning up a lot of plays that we ran. We had no film on Vegas but we have an idea of what New York likes to do. You only threw five passes in the first half last week. Do you expect to pass the ball more often in the first half this week against New York? The plan is to open it up more. Denny's M.O. is to throw the ball. With the Cardinals, we were a passing team with Anquan Boldin, Larry Fitzgerald, and Kurt Warner. The Oakland Raiders are really struggling right now. How do you think a UFL team would do against the Raiders? I don't know. (laughs) They have a lot of great athletes and they just need to get the ball rolling and come together as a team and score points. They have a good defense but their offense is sputtering a bit. They need to play four quarters of football and get a victory. You are good friends with Raiders' running back Michael Bush. Have you talked to him lately? Yes, I just talked to him the other day. He watched my first UFL game and told me he was proud of me. He was proud that I got the first ever touchdown in the UFL and also of the way my team battled out there. He told me to continue to be a leader. I also stay in contact with Darrren McFadden [Raiders' running back]. We have the same agent. Thanks for taking the time to talk to me Shane and good luck on Saturday against New York. Thanks, I am looking forward to the game. Strikeforce had a media conference call this morning with their CEO Scott Coker, Jason "Mayhem" Miller, and Jake Shields. The conference call was to promote the match-up between Miller and Shields for the Strikeforce middleweight title on November 7 live on CBS. The main event on the show will be Fedor vs. Brett Rogers. Here are some news, notes, and quotes from the conference call. This is his third time on CBS and he is excited to be part of the show. Has no problem hurting Mayhem. They are not friends but get along with each other. Mayhem Miller: "It is such a honor to be fighting Jake Shields. "It is great to have Fedora on the undercard." That was Mayhem's opening statement on the conference call. Mayhem was hilarious and entertaining with all his answers to the questions posed by the media. Says he would need liposuction surgery to get down to 170 lbs. He said he would need to cut off a piece of his head to go back to the welterweight division. "I am twittering, facebooking, and myspacing to promote the fight." Mayhem said he is looking for sponsors for the fight and if fans want their name on his shorts, he will do it for $75. "I am borderline gay with my showmanship flair." He said he is planning a very creative entrance to the cage. "It's business. I fought my dad so many times and we are still cool." He said he thinks it's strange for reporters to ask him how it feels to fight a guy he gets along with. He said if the media wants him to hate Shields, he will. He then started to cuss out Shields on the call and Shields returned the favor. "I will do everything better than Jake. "I'm just going to show everybody that I have the skills to beat Jake." Mayhem also said that a lot of young males recognize him due to being on MTV's Bully Beatdown show. He said he has never ducked anybody before and would fight Jacare Souza and Tim Kennedy on the same night if Coker wanted to do that. "We get to see Fedor fight for free on TV. I can't wait to sit in the front row and watch with my new Strikeforce belt." Coker: Strikeforce cards are stacked from top to bottom because he wants to give the fans a great show. Tim Kennedy could be the next challenger for the title or Souza. Souza will fight in December. Strikeforce heavyweight champion Alistair Overeem will fight in early February or late March. On new matchmaker Rich Chou - "Rich has a been a great addition to the team. He moved here from Hawaii. I have a real comfort level with him. He's going to have the ball and run with it. He will quarterback the matchmaking initiatives from here on out"
This video is from the Dodgers game against the Cardinals where a young Cardinals fan goes berserk on fans along with her boyfriend. The 2009 Gracie Open is this Saturday in San Francisco at the Kezar Pavilion. 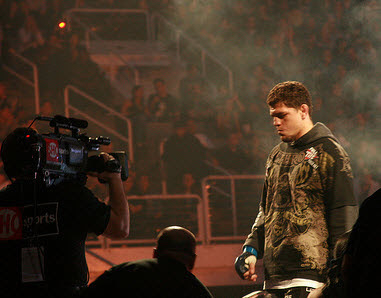 The Super Fight of the event is between Strikeforce fighter Nick Diaz and Lucas Leite. You can check out the competition schedule here. Fans can get into Kezar Pavilion for only $10 to watch the matches. Leite and Diaz' match will be a gi less jiu-jitsu match. There will be MMA and muay thai fights this Saturday night at the Santa Clara Convention Center in Santa Clara. The event is called "War of the Heroes 4." Tickets range from $35 to $50 and can be purchased here. The first fight will start at 6pm. For more information on the event, click here. Strikeforce and the UFC need some good female fighters so here are two! Tito Ortiz tweeted on his Twitter account yesterday that Mark Coleman has pulled out of their scheduled fight at UFC 106 in Las Vegas on November 21. Ortiz and Coleman were supposed to be the co-main event on the show. The main event that evening will be between Brock Lesnar and Shane Carwin. Ortiz tweeted "Coleman,coleman,coleman to bad he sissies out!!!" Coleman's friend, Michael DiSabato, said that Coleman suffered a second degree tear of his MCL and asked to postpone the fight until January 2. DiSabato is the VP of the clothing line, CageFighter. Who will Ortiz fight now? The UFC could give him Rashad Evans in a rematch but Evans probably does not want to fight Ortiz right now. Evans wants to fight a top contender and he probably would rather fight Thiago Silva instead. Silva is probably a more dangerous opponent at this point but if Evans wants a title shot against UFC lightweight champion, Lyoto Machida, he will have to fight another top contender like Silva. Ortiz is coming off a very long layoff due to back surgery and Coleman was supposed to be a tune up match for him. I could see someone like Keith Jardine stepping up to fight Ortiz. Jardine lost to Silva in his last fight and he might not be medically cleared to fight in November. Another possible opponent would be Forrest Griffin. Griffin and Ortiz fought in a very exciting match in California a few years ago. Griffin was last seen running from the cage after being knocked out by Anderson Silva a few months ago. Other possible interesting opponents are Dan Henderson and Houston Alexander.